THIS POST MAY CONTAIN COMPENSATED LINKS. READ DISCLAIMER FOR MORE INFO. Traveling with a newborn baby requires you to have a strategy. Planning ahead is an essential step, and one of the first things you should consider is where your baby will sleep. One of the best options I’ve found for a newborn baby when traveling is to use a travel bassinet. A portable bassinet for travel is a great option as it gives your baby a place to rest while you do your own thing. Not quite a crib but more than a cradle, a bassinet is a space for your baby to relax and sleep in safety. Below is a guide to help you find the best travel bassinet in 2018. Read though the infant travel bassinet reviews to find the best baby travel bassinet for your next trip. Looking for a baby travel bassinet? Take note of the following points to find the best one for you. By far the most important consideration regarding travel bassinets is their portability. There is a preference for compact, lightweight and foldable bassinets when traveling. Ones that come with a bag and handle are the most convenient in regards to portability. 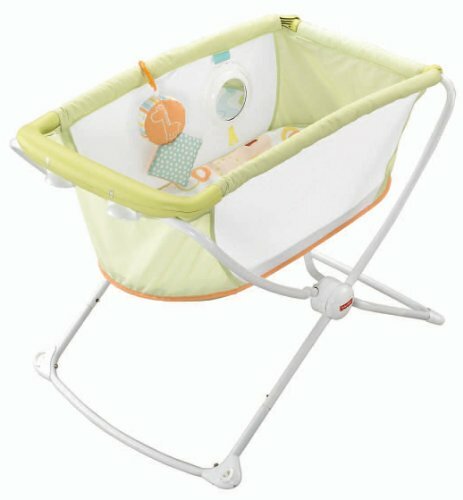 Some bassinets even have wheels so that when unfolded the bassinet can easily be moved from place to place. You can also find the most portable travel bassinet for airplane use. Although some bassinets can be transformed into a cradle, a travel bassinet by itself will offer limited movement. 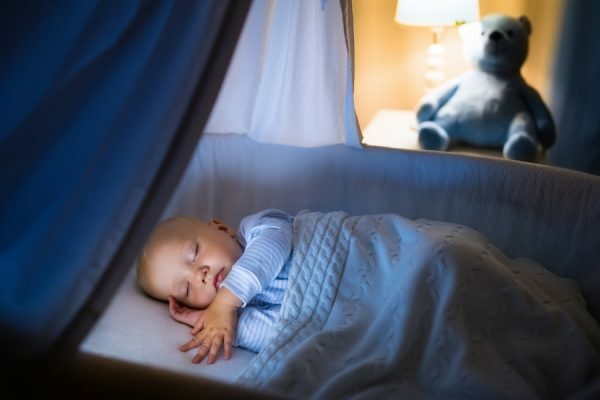 Movement can be good as it can help to rock your baby to sleep, but it can also be dangerous to leave a rocking baby unattended which is why a stable travel bassinet is better than a travel cradle. A travel bassinet is an option for naps while traveling, but using it as a permanent sleeping solution will depend on the bassinet you purchase. You may choose to purchase a portable crib for this. To ensure the comfort of your baby while they are using the bassinet, you can purchase a thin mattress and sheet for the bassinet. Most bassinets will include a thin mattress as standard but will require you to purchase any additional bedding you may need. Something to consider when you’re traveling is how to have all the items your baby needs within easy reach. A travel baby bassinet can be a great option to help you organize yourself while traveling. Many of them include pockets and storage underneath for diapers, baby wipes and other things you may need. In addition to the above, it can be nice to have other less important features like toys, sounds and vibration included in the bassinet. This can help a young baby get to sleep easier and more peacefully, especially in an environment that they’re not used to. These are extra features as they’re certainly not essential, and they can sometimes provide too much stimulation to a baby before they sleep. Also, they may require additional batteries to operate. The BRICA travel bassinet has received a recently updated design and is now better than ever. It remains one of the most popular travel bassinets for obvious reasons. The first thing to note is that it’s super safe. The BRICA fold n go travel bassinet locks into place in 4 different spots and you’ll know when it’s locked and secure. 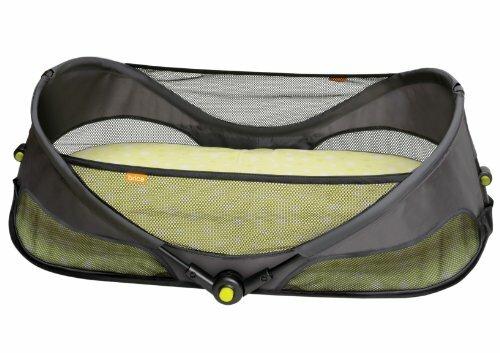 The fold and go travel bassinet has a mesh screen which is super secure and leaves the bassinet breathable and safe. One of the best parts of purchasing the BRICA fold and go travel bassinet is that is includes a mattress pad and fitted sheet. You can be sure that these are suitable for the bassinet and they’re comfortable enough for sleeping. This bassinet is pretty much made for travel. It’s also super lightweight and folds up compactly so that you can carry it with the handle. Not to mention maintenance is even easier as it’s stain resistant and can be wiped clean. This is definitely my pick for the best portable travel bassinet. Click here to see the price. While not the most portable option on our list, this Fisher-Price travel bassinet does fold flat and can be used in place of a travel crib. The benefit of having a full sized bassinet is that this one includes all the extras. At the push of a button you can make this travel bassinet swing creating a comfortable environment for an infant to sleep in. It’s also elevated above the ground offering a safe and secure area for your baby with a safe flat surface. Unfortunately this folding travel bassinet does not include its own sheets or mattress, but you can easily purchase these as additional extras and if you’re looking for a strong and secure bassinet for travel that will last, I’d highly recommend you do this. Another folding travel bassinet is the Summer Infant Travel bassinet. This is my pick as the best travel bassinet for airplane use. The Summer travel bassinet folds super compactly and includes everything you need to have a comfortable baby while traveling. 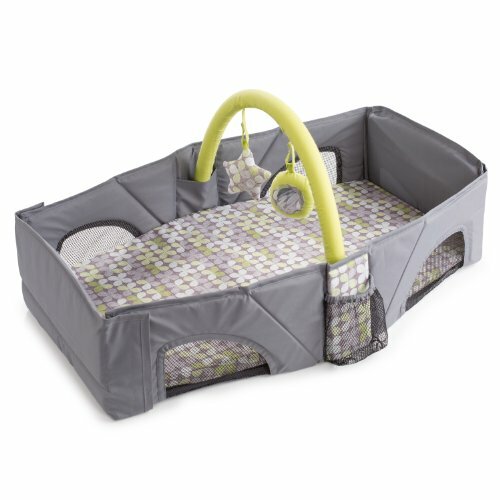 The bassinet includes a removable mattress pad and washable sheet. The mattress pad itself is not overly thick but you can make it a bit more comfortable by adding a blanket. The strap makes it easy to carry once folded, and it’s one of the most lightweight travel bassinets you will find. It also includes a toy bar for your baby. As one of the most convenient, affordable and lightweight travel travel bassinets for babies, it’s really hard to beat the Summer travel bassinet, especially as a travel bassinet for plane use. 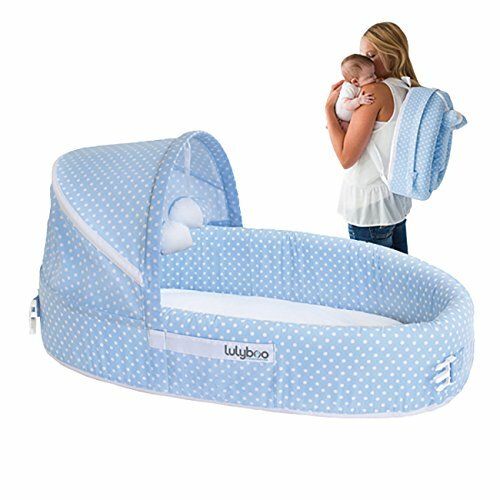 The most convenient 3 in 1 travel bassinet has to be the LulyBoo Baby Lounger. The first thing to note is that the hood is detachable for when you need to save a bit more space. There are also toys overhead and the hood can be positioned in 3 different spots. The bassinet is super easy to fold and is carried like a backpack making it convenient when you’re traveling. I also like that the base of this foldable travel bassinet is waterproof which keeps the surroundings dry if your baby does have an accident. The bassinet is soft all around which is comfortable but understandably can make some parents nervous when moving it around. However so long as you hold the sides quite tight this shouldn’t be a problem. There’s about 28 inches of space inside when it’s laid out so there’s plenty of room for a baby. 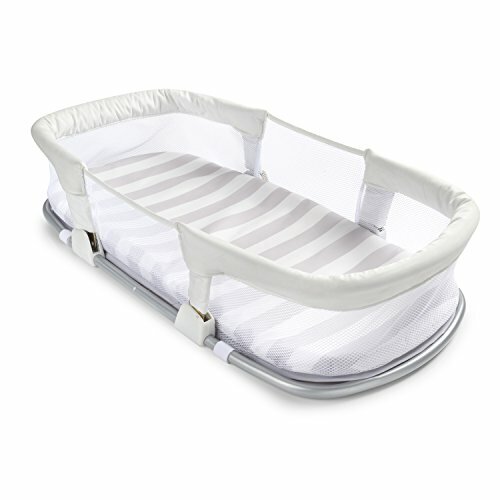 The sides are constructed using high density foam making them both soft and secure, and this portable travel bassinet can even be used as a changer. The SwaddleMe By Your Side bassinet is a super convenient baby bassinet travel option. What makes it so great is being able to remove and wash the included pad and fold the bassinet compactly to make it super compact and portable for travel. The bassinet collapses nicely for travel and is most conveniently placed inside a suitcase, although it does still take up a bit of room. The best thing about this bassinet is that when it is in use, there is plenty of space for your baby to roll around. The padded area is thick enough to be comfortable and although it’s compact, there’s plenty of space for your baby. The frames are also positioned in a way that they’re not intrusive when you need to reach in. There isn’t really an official weight limit for this bassinet but most recommendations say to stop using it when your baby can touch the sides and roll – which is generally around 3 months old. This is a great baby travel bassinet bed option. Disclaimer: Travel Crib Reviews is a participant in the Amazon Services LLC Associates Program, an affiliate advertising program designed to provide a means for sites to earn advertising fees by advertising and linking to amazon.com, amazon.co.uk, amazon.ca. Amazon and the Amazon logo are trademarks of Amazon.com, Inc. or its affiliates. We may receive a small commission if you click on one of our links and make a purchase. Thank you for supporting Travel Crib Reviews and helping me make it the best site possible! Welcome to Travel Crib Reviews. My name is Ellie and I am a traveling mom who wants to help you find your perfect traveling crib. Read more about me. Travel Crib Reviews Copyright © 2019.